Part 1 Rectangular Double Braids, see also Part 2 (flat double braids) and Part 3 (hollow double braids). Even more types of double braids can be made than these three. I describe the others in my article in Threads That Move – see books in sidebar. Here on the blog I also have short text instructions for one more variation – the ‘Side-slit’ double braid here. Two-worker loop braids; multi-person fingerloop braids; team braids, double braids—whatever term you use, these are the braids that are tantalizingly out of reach for most loop braiders, because the traditional methods for making them require two braiders working together on one braid. It’s not hard if you can find another braider—for most doubled fingerloop braids, each braider essentially does the same moves as for a regular square braid. The problem is finding that other braider! The first few years I was loop braiding I didn’t even know any other loop braiders…These days I know quite a few, but I can still count on my fingers the number of times I’ve had a chance to team braid with any of them. A year or so after I started braiding, I bumped into Sarah Goslee’s method for making 10-loop double braids as a solo braider on her Phiala’s Stringpage site, and was blown away by the very idea that these braids were possible to make on one set of hands. *¹ I made a few following her directions, which was very exciting. But although the method worked, I didn’t end up using it very often, because the braids seemed so slow to make—probably because all the loop-shifting for the two outer loop transfers had to be done by the other hand. I knew it would be faster if I could just figure out a way to get my thumbs to hold a loop. But even though this worked for square braids, somehow everything ended up tangled when I tried it with a double braid. The idea preyed on my mind, though, and eventually I managed to figure out a way. It took reducing the number of loops to a doubled 3-loop braid first, instead of a doubled 5-loop braid. Once that worked, I was able to add loops until I had five loops per hand. With only one loop per finger, the braid had very straightforward, same-hand loop-shifting moves. Plus it was just as easy to unbraid as to braid (handy, since I almost always make mistakes when I braid). reverse side, solid rectangle Edge patterns. Click twice on photos for more detail. It was only when I was casting about for a workshop topic to propose to the organizers of Braids 2012 that it hit me: 6- and 8-loop double braids don’t even require thumbs! I had only ever made a few of these, back when I was first figuring out my solo-braider method for the traditional 10-loop version. So I started experimenting with them, and was amazed at how great they turned out. All the same shape variations could be made as with 10-loop double braids, and many of the traditional color-patterns as well. But there really aren’t any hordes when it comes to loop braiding! And anyway I want to promote loop braiding, not hide it away. So I’ve decided to post video tutorials on my double braid solo-braider method here for anyone who is interested. I would love to hear from you if you try it. Happy Holidays, and Happy Braiding in 2013! Solo-braider tutorials for 6, 8, and 10-loop double braids. Learn 5-loop square braids before learning the 6-loop double braid (this 6-loop braid is a doubled version of the super-easy 3-loop braid). Learn 7-loop square braids before learning 8-loop double braids, this will teach your ring and little fingers to braid independently of each other. Before learning my 10-loop double braid method, learn how to use your thumbs in braiding a 9-loop square braid. Note: All these videos are made in super-slow-mo speed as any can be an intro to double braids, depending on how many loops you can already use (easily) in making square and flat braids. 1:23 Slow demo of a divided braid (loops transferred without a turn–this will form a loop at the top of the braid.). 11:40 Slow demo of the ‘solid rectangle’ variation (all loops turned while being transferred). Start watching at 15:54 or 19:15 for slightly faster moves, and less talking. Skip ahead to 20:56 to see it with less talking. 24:10 The color-order for this braid–how to set the loops up in the color-order you want for your braid. 1:38 Loop set-up (all dark shanks in ‘upper position’). Showing upper vs. lower shanks on the thumbs. 3:18 Explanation of ‘divided’ braid moves in a double braid. 3:36 Explanation of ‘inner’ vs. ‘outer’ loop transfers in double braids. 4:16 Start of the first actual braiding moves for a divided braid. Skip to 17:43 to see this with less talking and pausing. 17:43 Divided braiding moves, less pausing/more braiding. 19:32 Tips on how to manage the thumb loops to keep them from falling off. 26:00 “Solid rectangle” double braid moves–here you will turn all the loops when transferring them. This creates the “solid rectangle” form of the braid. 0:00 Examples of finished braids. 2:38 Lifting “parked loops” off a peg-type holder. 5:07 Braiding: Solid rectangle (all loop transfers are turned/ reversed/ crossed). The color pattern was called Crowns in the 17th C. loop braiding manuscripts. 12:24 Unbraiding back to beginning. 19:51 Starting over (braiding the Crowns pattern starting from beginning again). 25:42 Switching to the color set-up for the pattern called “Edge” (also known by other names). Sorry, I ran out of time, and the video cut off at the end. See below for the loop set-up for making the 10-loop Edge pattern. Those 3 forms were all you got with square braids. But, believe it or not, double braids have at least nine more shape variations! (photo below shows the double-tubular shape) That’s why I teach this braid as a two-day workshop—there is so much that you can do with it. Each of the twelve forms has some distinctive color patterns that can’t be made in the other braid shapes, so aside from being very-to-slightly different in shape, the twelve different types of double braids also offer a lot of color pattern possibilities. Following this sequence, you would set up your loops with your darkest blue loop on the left middle finger, next lightest on the left index finger, etc. The very lightest blue loop would be on the right little finger. This is a totally different loop order than the one for square braids (see my post on color pattern planning for square braids). Middle finger loop is first, index second, then ring, (little finger), followed by the same order of loops on the other hand. I also show this order in the videos. Loop set-ups for bicolor loops have an extra element to consider. The upper and lower colors of a loop will change whenever the loop is turned. Below are instructions for some bicolor pattern set-ups for solid rectangle braids of 6, 8, and 10 loops shown in photos. All loops bicolor, same two colors. Start with all light (or all dark) colors in upper-shank position. In the photo further down of the two green/yellow braids, the top braid has alternating Crowns and Edge patterns. 2 loops red, 2 purple, 2 orange, 2 blue, 2 green. One loop of each pair of colors will be on the right hand and the other on the left. Set these up on your hands following the directions above for “Edge”. Be sure to set them up so the colors match on the fingers of both hands (same bright color on left and right A fingers, left and right B’s, etc). If you want these colors to be in a particular order in the braid, refer to the Color planning and loop set-up sequence I give above. The set-up is exactly as described above for the Edge pattern, EXCEPT: turn one loop of only one hand (any finger on that hand) to be in the opposite dark/light starting position than given in the instructions. The Chevron pattern will look quite different on the two sides of the braid! If your braid doesn’t look like the braid in the photo, turn it over and look at the other side. The first braid in the photo below has both the Crowns pattern (W-shapes across the braid), and the Edge pattern (dark edges, light center). The set-ups for both patterns are described above. To switch between these patterns, the easiest method is to stop braiding and turn some of your loops over on their fingers to be in the new pattern position. A better-looking way, with a cleaner pattern-transition is to braid your way into the new pattern (see below for my attempt to explain this). In the second 10-loop video, I got cut off at the end. I was in the middle of showing how to change from the Crowns pattern to the Edge pattern in a smoother way than by just turning the various loops to be in their new positions (turning them works, but the pattern transition doesn’t look as clean). A cleaner way to make bicolor pattern transitions is done by transferring loops with or without a turn, depending on what their new dark/light order on the fingers should be. Temporarily you just stop following the ‘turn all transfers’ rule for making a solid rectangle braid. If the loop you are about to transfer (the loop on the middle finger) happens to already have the correct color facing up (for the new pattern set-up), then you transfer it ‘correctly’—with a turn. If it DOESN’T have the correct color facing up (for the new pattern), you transfer it ‘incorrectly’—that is, without a turn. After doing this for a few cycles the loops will all be in the correct arrangement for the new pattern. At that point, you resume braiding as for a solid rectangle braid (turning all the loops when transferring them). The Edge pattern has a one-cycle pattern repeat. The loops will all be back in the same color-distribution on the fingers after each braiding cycle, rather than after 5 cycles as for the ‘Crowns’ pattern. Attn: Braids made with only bicolor loops will have opposite colors on the two sides of the braid! My Edge pattern instructions above will result in light edges/ dark center on the side facing the braider, and dark edges/ light center on the side facing the floor. That lower surface is actually slightly wider than the upper surface,*³ so I usually consider the lower side the “good” side of the braid, and plan my colors according to how they will turn out on the lower side of the braid. For any braid that has one or more bicolor loops, it can be interesting to also try setting the loops up on the fingers so all the bicolor loops have the opposite color facing up than the instructions say—you might like that result better. Semi-flat peaked double braids. Upper braid also has short sections of divided braid (between the motifs). Btw, this isn’t a real commercial! more of a fyi. 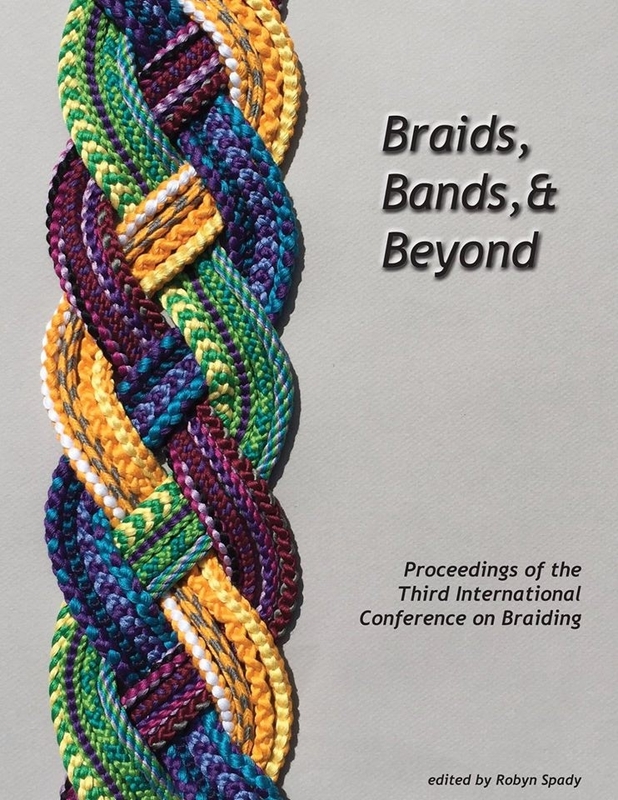 All proceeds from sales of this book benefit the Braid Society (and/or go toward funding past and future International Braids conferences), not individual contributors/authors. Double-tubular double braid (called couvert in the old manuscripts) This example has interspersed short sections of ‘flat’ braiding—so short that those sections actually end up looking like holes through which the inner braided tube can be seen. The two tubes are not connected–they can slide freely if tugged. Here I had pulled the inner braid upward so I could let it protrude out of the holes a bit. I’m so glad I managed to get this post up before the end of the year! We are heading out of town for a week or so but I will check the blog as soon as we are back, so please let me know if you have any questions or corrections. I won’t have time to go over it all looking for the glaring errors I usually find right after I post. Happy Braiding and Happy New Year! For setting up the patterns above as a two-person braiding team, the loop order for lining up your colors in the braid will be completely different. However the specific color-patterns I describe should not be hard to translate if you refer to instructions on other sites for setting up Crowns, Edge, and Chevron as two-person, 10-loop braids. On Cindy Meyers’ Silkewerk site: Edge is called “A thick lace bordered“. To me, her instructions for making the braiding moves as a 2-person team are much easier to follow than those of fingerloop.org. She doesn’t give the 2-person color setup for the Chevron pattern variation that I describe above, but Fingerloop.org does give it. 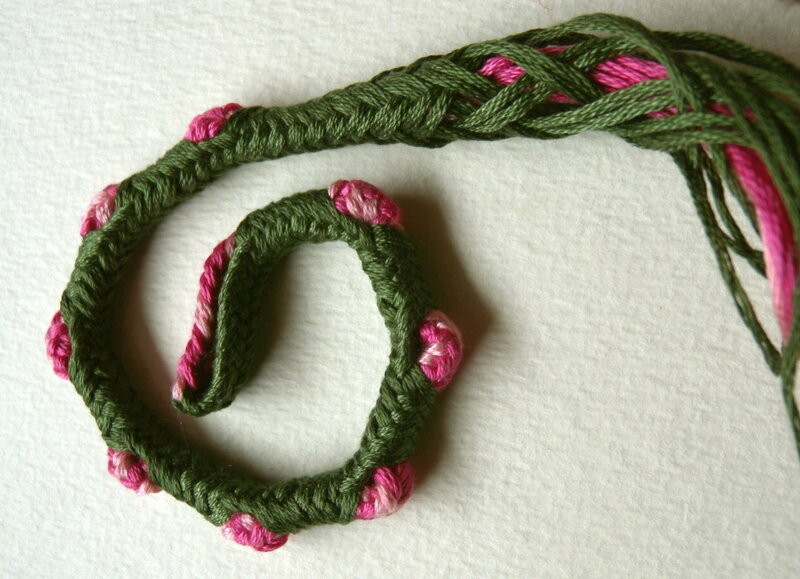 Fingerloop.org describes the Chevron setup below the 2-person double braid pattern called with the wave. After teaching ‘with the wave,’ they explain how to set up for some other color patterns of that braid (all are what I call “solid rectangle double braids” so they have the same braiding moves, it’s just the initial color set-up on the fingers that is different). The patterns I describe here are these three classic patterns, plus two variants of Edge. In one, the One-Loop-Wrong variant, just follow the other sites’ directions for setting up the loops on two braiders’ hands for “with the Edge/a thick lace bordered,” but turn one bicolor loop (on ONE braider’s hand only!) to be in the opposite dark/light configuration than the directions say. The left braider’s LEFT index finger and the right braider’s RIGHT index finger should hold the same colors, and so on. *¹ Phiala’s String Page teaches a solo-braider method in which the braider holds 2 to 3 loops on the index fingers. Joy Boutrup makes double braids by herself using hand-held loop braiding, and kute (handles) to hold the loops. Click here for fingerloop.orgs’s instructions for two co-operating braiders. (Surprisingly, for double braids only, fingerloop.org’s directions have the two braiders using the V-fell method that I teach on this blog, and that is commonly used in Asia and the Pacific, rather than the A-fell method that their site teaches for square braids. Noemi Speiser’s OEPBforLB teaches two-worker braids in more detail, and alludes to her own method for making them solo, but doesn’t teach it. The book Tak V Bowes, Departed teaches how to make two-person braids, and does it well, judging from two of the loop braiding participants I met at Braids 2012. Double braid is my own rather inexact term. The term ‘double braid’ is also used by some kumihimo braiders, but with a completely different meaning. To them, it denotes a two-layer braid, usually as made on a takadai (specialized braiding stand). In contrast, most finger loop braids are braided on two layers without the braider even being aware of it, so we don’t need a special term for that, it’s already assumed. Doubling the braid widthwise is the tricky and interesting process in finger loop braiding, which probably is only a question of using more bobbins in a stand-and-bobbin braiding process. *² I still highly recommend learning how to use thumbs in braiding first—ie right after learning 7-loop square braids. To me, loop braiding is even more rewarding if you can use those two extra digits, instead of letting them go to waste. And then you would be able to go from 8-loop double braids right up to the full, classic 10-loop double braids of the old braiding manuscripts. You don’t need to have exceptionally limber hands to use thumbs in loop braiding. I was almost 50 (with stiffer fingers than when I was younger) when I first learned how to loop braid. Thumbs are naturally adept. Try resting all your fingertips on a table, then test one finger at a time to see how easily you can lift it, or trace circles with it on the table, without moving the other fingers. The thumb and index finger will probably be about equal. It isn’t necessary to have a curved thumb like mine. I can’t hold my thumb straight (it starts to tremble) or I would demo myself that the curve in it isn’t necessary. Students of mine with straight thumbs have found that my thumb methods work for them, too. If you’ve only recently learned how to make 7-loop square braids, go ahead and learn 9-loop braids as soon as you’re fairly comfortable with 7 loops. That is, when it’s easy to remember the moves, and loops only fall off occasionally, but you still need to pause your braiding in order to carry on a conversation or look up. When long-time loop braiders who are already lightning-fast and proficient at (five, or) seven-loop braids first try using (little fingers, or) thumbs, the simple fact that the new move doesn’t happen automatically, or that they have to slow down seems to be a shock to many of them. The contrast between the ease of braiding they are used to, and their clumsiness in the not-yet-acquired skill can make them feel that the new skill must be impossibly hard. (It’s not!) Relatively newer loop braiders don’t necessarily have that perception. They are still braiding fairly slowly and methodically, plus they can clearly remember progressing quickly from clumsiness to competence with 5 and then 7 loops, so why should this be any different? This is an difference in attitude, not in the actual ability to learn the new skill! Long-time loop braiders learn it at least as fast or probably faster if they just push beyond past the initial sensation that they “can’t” do it. *³ The lower side ends up being the widest because of the direction I turn loops—as if the two braiders of a team braid were turning their loops from above. If loops were turned in the opposite rotational direction than I teach (“from below” for both braiders), the widest surface would be the upper surface—the side facing up while you are braiding. Interestingly (to me, anyway! ), the solid rectangle double braid can in fact be made in such a way that the upper and lower surfaces are equal in width. In the videos, I teach the traditional way that the loops would be turned if the double braid were being made by two co-operating braiders: both braiders would typically turn all their loops from above, or both would turn all their loops from below. Either way results in one surface being wider than the other. If, instead, each of the two braiders turned the loops on one hand from below the loop, and the loops on the other hand from above the loop—the two braiders ‘mirroring’ each others’ moves—the resulting braid would be evenly rectangular in overall shape, with upper and lower surfaces of the same width. This is almost certainly not the way the ‘solid rectangle’ braid has ever been made traditionally. I checked with Joy Boutrup about this, and she said that the extant two-worker braids (of this solid rectangle type) that she has seen in museums all have one wider and one narrower ‘wide’ surface, so were all done the traditional “one type of turn” way. I refer to that traditional way as having “countered turns” and my alternative way as having “balanced turns”. It feels very unintuitive to use balanced turns when team braiding, though once you get used to it, it isn’t difficult to do. But it feels fine to do it as a solo braider –or maybe both ways feel equally unintuitive! With my solo-braider method, this non-traditional “balanced turns” method is done by turning both transfers of one hand in the same rotational direction, say counterclockwise. And both transfers of the loops on the OTHER hand in the opposite rotational direction, so clockwise. This is what I almost always do now for the solid rectangle form of the double braid (though sometimes I prefer the traditional way I show in the videos, where one side of the braid ends up wider and more emphasized). For the non-traditional ‘balanced turns’ method, I turn the thumb transfers (the outer transfers) exactly as I demo in the videos, but I turn the INNER transfers (first and third transfers) from below—that is, in the opposite rotational direction from the way I demo it in the videos. Note: Even with this “balanced turns” method, the two wide surfaces are still slightly different in appearance! Although the overall width of both surfaces is equal, and the two wide surfaces both look symmetrical, the widths of specific columns/ ridges of each surface are not identical top to bottom, so the appearance of the braided pattern will still be slightly different on the two sides of the braid. Just as with the traditional method, it is still worth trying any bicolor pattern with darks and lights reversed (switching the surface of the braid on which they appear)–you may like one way better than the other. Ingrid, I’m so psyched! I started playing around with this today (8 loops) and I get it! Thanks for your excellent videos. I am looking forward to exercising my thumb for 10 loops and playing with colors next.